There are many different types, options and materials that high index lenses can be made from and all have different features and benefits depending on your needs, budget and prescription. 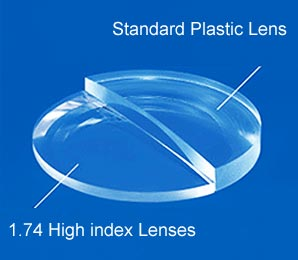 Standard or 'regular' lenses are made from a plastic known as CR39 and have a 1.5 index. This is the type in which all inclusive frames are made with. The index of refraction; is the speed of light in a vacuum divided by the speed of light in a material. The refractive index is the extent to which light is refracted when it enters a medium. The greater the index the more refraction occurs. Air has an index of 1.0, water is 1.3 and many type of glass are around 1.5. Higher index lenses bend light at a steeper angle than lesser index versions. The ‘index’ is the result given as a number: 1.5,1.6,1.67 or 1.74 and the higher the number, the more light is bent or 'slowed down'. Therefore, these lenses have less curvature for the same focal power requiring less lens substance/material. The result being high index lenses are thinner than lesser versions but achieve the same focal power. High index lenses are made of a plastic material which bends light more than standard CR39 lenses and can therefore be made thinner and lighter allowing for more cosmetically appealing and comfortable to wear glasses. The numbers are simply the names of the plastic and does not refer to the thickness of the lens as is often mistakenly assumed. How Much Do High Index Lenses Cost? As with most purchases in life..you get what you pay for and not all lenses are the same . We offer 'Hoya' branded high index lenses. Hoya have been well established as a leader in the optical industry for nearly 100 years and are well known for producing some of the best high index lenses and lens coatings that money can buy. Quite simply, you will not find a better quality lens at any price. Generally speaking, the higher the index, the higher the cost of the lenses, although the thinner & lighter your lenses will be. “No Quibble 30 Day, 100% Money Back Guarantee” & "2 Year Frame & Lens Warranty". High Index lenses are available in nearly all lens types, materials, coatings and designs, such as varifocal lenses, photochromic lenses and polarised lenses. 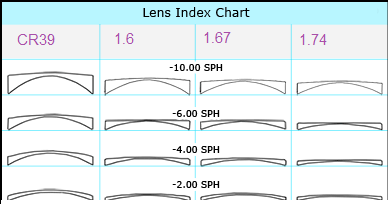 High index lenses are much thinner due to their ability to bend light. As they bend light more than an ordinary lens they can be made much thinner but offer the same prescription power. As they can be made thinner, they contain less lens material and are therefore much lighter than ordinary lenses. These benefits will increase the higher the index lens option selected. The more the lens bends light, the thinner and lighter it will be. With fewer reflections, more light passes through the lens to the eye for good vision and the lenses look more transparent and attractive. Anti reflection coating is especially beneficial when used on high-index lenses, which reflect more light than regular plastic lenses. Anti-reflective coatings allow 99.5 percent of available light to pass through the lenses and enter the eye for good vision. By eliminating reflections, A/R coating also makes your eyeglass lenses look nearly invisible so people can see your eyes and facial expressions more clearly. Anti-reflective glasses also are more attractive, so you can look your best in all lighting conditions. Please don't hesitate to contact us should you require any further information and one of our advisers will be happy to assist you in selecting the correct high index lens option for your prescription, lifestyle and budget.